Please support the arts and visit Kimberly Bennett's artistic friends websites. so click on some links and discover something new! Christine Soltis- Christine Marie Soltis was born and raised in Washington, Pennsylvania. Her deepest passion is in fiction writing and has been for the past eight years. Of her eleven written novels, five have been released to the public along with three poetry books and a short story compilation. In addition, she creates her own cover photos and promotional videos. Gary Lee Vincent-Gary Lee Vincent is an author of thrilling fiction living in Clarksburg, West Virginia. His published works include his 2010 release, Passageway. Passageway is part HP Lovecraft and part Indiana Jones, this deadly tale will keep you guessing until the end! Jon Sprunk-Jon Sprunk is a fantasy author living in central Pennsylvania. His debut novel, Shadow's Son, was published by Pyr Books in 2010. And the upcoming sequel, Shadow's Lure, will be out this June. Kelly R Martin-Kelly R Martin was born in Rockford, Illinois, and he attended the University of Illinois at Champaign/Urbana. His book, Thomas the Poisoner, is a culmination of his dream to write novels ever since he was a twelve year old boy. Rich Bottles, Jr.-"How Many Lumberjacks Does it Take to Ravish, Maim and Kill Five Feisty Female Co-eds?" Read 'Lumberjacked' by Rich Bottles Jr. to find out! I would like to welcome CJ Roberts to the wonderful world of self-published authors! Her debut book, Captive in the Dark, was released September 1st, 2011. CJ was born and raised in Southern California. Following high school she served ten years in the United States Air Force. She is married and has one daughter. Virta Studios is located in Toledo, Ohio. We primarily focus on video creation and entertainment for the global community. Our service includes Video Production, Video Editing, Photography, Graphic Design, Web Design, Special Effects and Sound Design. 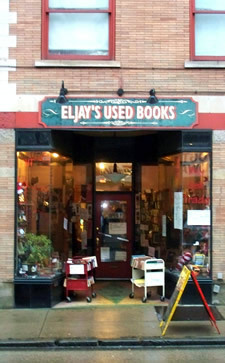 We are a multi-interest used bookstore operating out of Pittsburgh's funkiest neighborhood, the Southside.